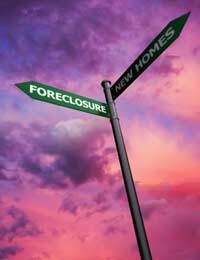 Foreclosure is normally associated with the American banking and mortgage lending industries but is now becoming a popular term in the United Kingdom as well. Here we look at foreclosure and the reasons why it may happen and what can be done if your mortgage lender decides to foreclose on your home. Foreclosure is the term used to describe the process initiated by a bank or building society when they see no indication that you can continue to pay a loan or mortgage they have lent to you. In essence this means that they are about to start proceedings to reclaim your home or other property as a substitution for the outstanding amount of money. If you have borrowed money from either a bank, building society or other mortgage lender and are behind with the payments, the lender can decide that they have made all reasonable attempts to (a) contact you regarding your arrears or (b) have no reasonable chance of recouping the loan amount from you. If either of the aforementioned options is the case your mortgage lender can apply to the courts for what is known as a Possession Order. This Possession Order is the first step in the chain and means that you must appear before a magistrate and give reasons as to why you have not been able to pay the mortgage or loan back as originally agreed. At this point you will be given the opportunity to state your case to the magistrate who may, depending on the nature of your reasons and whether or not you can back this up with proof, decide to give you more time to pay the arrears. If he or she makes this arrangement you will have a set period of time to clear the arrears off whilst still making the required payments. At this time the magistrate will issue what is known as a Suspended Possession Order. If you have been able to prove that the reason you are behind with your repayments if beyond your control and the magistrate has allocated you more time then he or she will issue the Suspended Possession Order. This order allows you more time to pay but safe guards the mortgage or loan lender by stipulating that if the arrears are not cleared by a stated date then foreclosure proceedings can continue thus resulting in eviction. In essence a Suspended Possession Order is a delay on proceedings and is designed to give all parties time to come to an amicable arrangement. If no agreement can be reached, i.e. : the lender refuses your offer of reduced payments, then the magistrate can step in and make what he or she thinks is a fair repayment plan. It is worth noting at this point that the magistrate’s decision is final and must be adhered to by all parties. If you have reached the stage where an eviction order has been made then unfortunately there is nothing more that can be done unless you can manage to repay all outstanding arrears in one lump sum. Unfortunately it is a sad fact that many people throughout the United Kingdom find themselves in this position every year and the numbers are rising annually. If you are issued with an eviction order then you will have a set period of time to vacate the property after which time, if you have not left of your own accord, you will be removed by an officer of the court (usually a bailiff acting on the court’s behalf) who will be accompanied by the police. It is worth noting at this point that the officer of the court accompanied by the police have the power and legal right to enter the property should you decide not to open the door or if you are not present on their arrival. If you find that you are having difficulty paying your mortgage or a loan amount then you should immediately make contact with your lender and explain the situation to them. If you can it is worth making an offer to repay at an amount you can reasonably afford until such times as your circumstances improve. In many cases your lender may not accept this offer but may come back to you with an offer that they think is reasonable. It is worth discussing with them all of the options. In reality the best advice that can be offered should you find yourself falling behind with repayments if not to ignore the problem. Make contact with lenders as soon as you realise there is a problem and try to make an arrangement with them. Also it is worth consulting with your solicitor if you have one or alternatively your local Citizen’s Advice Bureau. Thanks for sharing a informative post.it is really helpful.the blog you have shared on home owner loans is really useful.Payday Loans are one of the most preferred small-sized quick cash loans that can be availed conveniently from private lenders and can be repaid on the next payday or on a scheduled day after your paycheck get cleared. you can choose to avail the Payday loans onlineand apply for it on our website using our simple online loan application.